These are just a few things that have kept me from being as regular a blogger as I have wanted to be. The drama queen in me tends to look at these reasons as a band of villains that conspire to bring me down. The practical me is struggling to accept the fact that some things are just not in my control; at times, it’s best to go with the flow. Amid these regular life struggles came the realisation that it’s been a whole month to the big fat Bengali wedding I attended in February. My cousin baby brother has been married for a month already! That wholesome and chunky little white infant is a married man! Wow! Now I know what the relatives mean when they react with the astonished “you’ve grown up so much!” when they meet me. That’s how I felt during as the kid got hitched! The wedding will continue to be a point of discussion in the family for a while now. After all, the point of a big wedding that involves family, friends and their friends, is to create memories that last you a lifetime. My parents who’ve been married for over 40 years continue to share a laugh about incidents from their wedding; or incidents that took place at family weddings over the years. • Like the rosogolla eating competition at an aunt’s wedding. • Or that time when I walked into a glass door at a cousin’s wedding and sported a swollen nose as an accessory. • Or the time when a group of European friends was force-fed a huge plate of mishti each! Thankfully for us, they were sporting enough and had a good laugh when our game was up! “Clueless friends” are a fixture at every family wedding I’ve attended. These friends are lost in the hullabaloo of the wedding household. Some of them are lucky enough to find a seat next to a benevolent elder who explains the proceedings to them; which just means they are 20 per cent more clued in than they were before. And I count them to be fortunate! Now for those who’ve already survived a wedding like this, my heartiest congratulations to you. And those planning to get married and/or attending a Bengali wedding in the near future, I’ll help you with the first thing listed in the kit. So here’s what happens at a “Bengali Wedding”. Note: A wedding in the average Bengali household is a non-flashy (mostly) but colourful affair filled with elaborate preparations. Called ‘biye’ in Bengali language, rituals followed depend on the subculture of the family – the Bangals and the Ghotis. The former being Bengali Hindus who have their roots in modern-day Bangladesh and the latter being those with roots in West Bengal. The rituals are further tweaked by elders of the family over a period of time to suit time, space and availability. 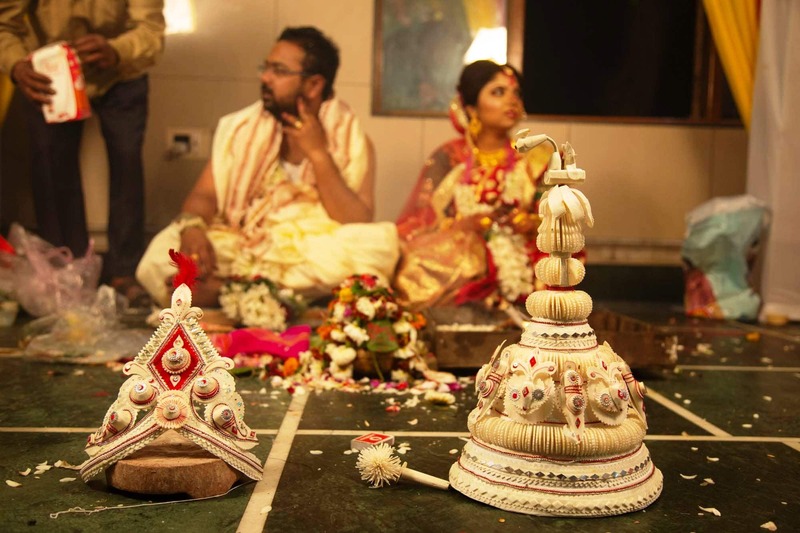 Aashirvad – Literally meaning ‘blessings’, this is the ‘formal acceptance’ ceremony wherein the bride and groom are blessed by their partner’s family members with gifts (of the material kind). This ceremony is not necessarily the first of the wedding rituals. Depending on circumstances, the aashirvad can be done a few months before the wedding or immediately before the wedding. In my elder sister’s case, the aashirvad ceremony was conducted right before the ritualistic wedding ceremony. Ai Budo Bhatt – This is the last meal a to-be bride/groom eats as a bachelor/bachelorette and is an elaborate affair held a day before the wedding. The ai budo bhaat entails the bride/groom being offered an elaborate feast including rice, vegetarian preparations, fish curry (especially the fish head), chicken-mutton or both and a selection of the finest sweets. Paayesh (Bengali rice pudding) is a must during the ai budo bhaat. Note: At most of these ceremonies, blessings are given using dhaan (while rice in shells) and dubbo (tri-headed grass). Conch shells are blown to the accompaniment of ullu dhwani to signify the auspiciousness of the moments. Dodhi Mongol – Marks the beginning of the wedding day that begins at dawn. The bride and groom eat a meal of doi (curd) and khoi (kind of puffed rice) – following this they fast till the wedding ends. In some families, this is when the girl is made to wear the shaankha–polla, traditional conch shell and coral bangles. Note: Photographs belong to Gautam Chakravarty-Megha Hariramani / Abhisek Biswas-Reshmi Karar. Reuse of photographs without permission of either parties will be considered infringement of copyright. That’s beautifully written! One can almost imagine a wedding right in front of their eyes as they read through! Looking forward to the next one! Thank you! Was hoping the post would read like that.